Experts say you should buy a boot that leaves you with a tiny bit of wiggle room, especially if you layer it with two or three socks! Bottom line: always go for a looser fit. Snow boots aren't the bulky winter footwear they once were. In fact, today's snow boots have proven to be one of the best-kept secrets of winter fashion wear. Not only do they provide ultimate protection from the snow and cold but they also often have a stylish design that can tie any winter outfit together. Tired of using those cheap-o summer rain boots as your winter wear? Slipping on ice every time you walk out your front door? It might be time to scope out a warmer, more reliable option. Check out these highly rated snow boots for all-purpose footwear and fashionable winter accessory all in one. By far one of the most important considerations when picking a snow boot is the warmth rating. Many of the better brands rate their boots according to their temperature capabilities, for customers ranging from the humid winters of the south to the coldest parts of the globe. When looking at a specific boot, check out the company's website to get an idea of the temperature rating and what kind of climate the boot is fit to handle. Customers living in wet conditions should consider purchasing pac boots -- snow boots with a removable liner -- for ultimate warmth. The removable lining is ideal for wet weather because it speeds the drying of cold, damp boots, making them warm and cozy in half the time. Be aware that boots with higher temperature ratings or a high-quality lining are more expensive. However, the extra money might be worth it for warm, dry feet. When examining a pair of snow boots, keep in mind your desired height. Snow boots range from ankle height to just below the knee. Shorter boots allow for maximum mobility and are often the most lightweight option, but they provide less protection from snow and rain. Taller boots offer far more protection from the elements because snow is less likely to sneak into the cuff. However, taller boots are heavier and less flexible. Customers seeking a happy medium should consider a boot that reaches to mid-calf, which is relatively flexible, only moderately heavy, and offers better snow protection than ankle-length boots. One key consideration when picking out snow boots is the quality of the sole. It should be made of waterproof material and have good traction. Good traction in a snow boot translates into the sole being softer and more flexible than the harder, stiffer soles on hiking boots. Flexible soles grip onto ice and help prevent slipping. The soles should also have a deep tread for walking in snow. Customers seeking ultimate comfort should always invest in boots with a quality lining. GORE-TEX lining is completely waterproof and lauded for its remarkable warmth, but you'll pay a pretty penny for its cold-rejecting superpowers. Thinsulate is another synthetic material highly rated for its moisture-wicking and warming capabilities, though it's also quite expensive. Wool and felt are great middle-of-the-road options for those who want quality warmth for less money, and the materials tend to be extremely lightweight. Q. Are winter boots and snow boots the same? A. Though often used interchangeably, winter boots and snow boots fall into two different categories. Winter boots are crafted primarily with the wearer's warmth in mind, while snow boots are created for heavy-duty snow and ice wear. If you're looking for a pair of boots to keep you warm around the house or town, pick winter boots. 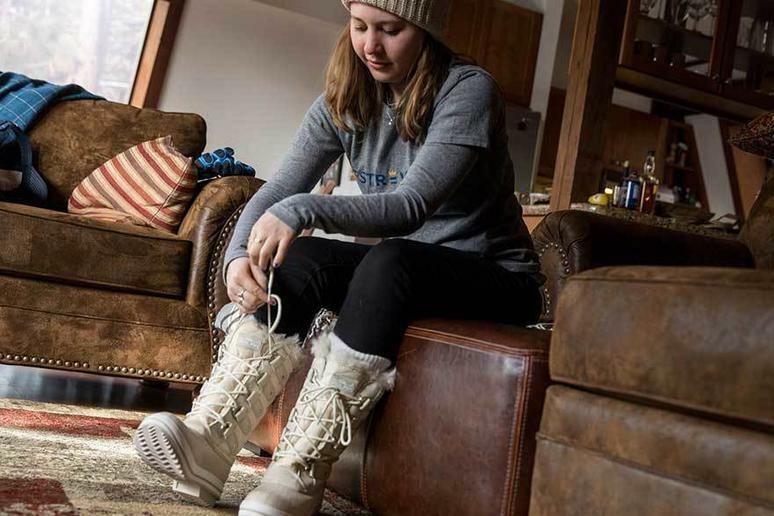 If you want a pair of versatile boots made to handle the elements, snow boots may be the better option. Q. What kind of socks should I wear with my snow boots? A. Always go with high-quality wool socks to keep your feet warm. Wool has fantastic insulating properties, so much so that it can keep skin warm even when it's wet and damp. Users in extremely cold climates might want to wear two or three socks with boots: a liner sock to wick sweat from your feet, a lightweight wool sock, and a heavy wool sock. Avoid cotton socks at all costs because the material loses its insulating properties when wet. Our take: Customers living in the coldest, snowiest, wettest winter conditions will be happy to own these tall, top-of-the-line snow boots. What we like: Crafted in a pac boot style with removable lining for quick drying and ultimate warmth. Extra tall for maximum leg coverage. Waterproof. What we dislike: Upper shaft can be rather stiff compared to shorter boots. Our take: Remarkably inexpensive tall boot designed for serious weather conditions. Great for city walking. What we like: Customers rave about the waterproof exterior and warm, comfortable lining. Covers leg to just below the knee. Durable rubber sole. What we dislike: Sizes run on the small side. Foot bed too narrow for some feet. Our take: Those who don't want a calf-length boot should check out this shorter option from a well-known brand. Fantastic choice for those who do a lot of winter walking. What we like: Buyers laud the impressive flexibility. Sturdy sole and heavy-duty traction perform well for outdoor enthusiasts and customers who walk a lot. Waterproof. What we dislike: May be slightly uncomfortable for customers with high arches.